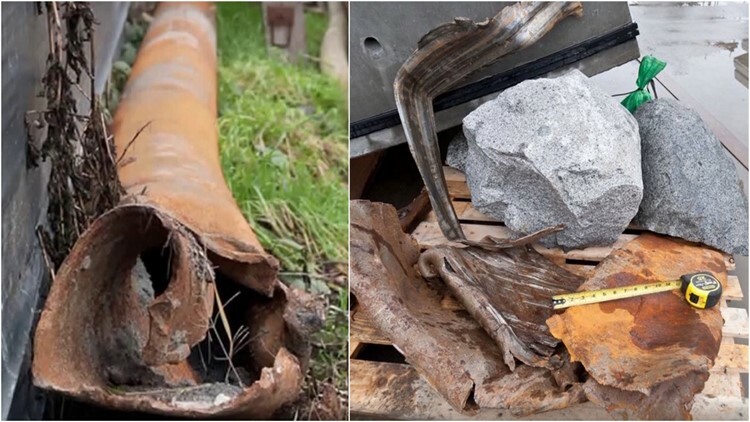 Two months into demolition, about one-third of the Seattle viaduct is gone. 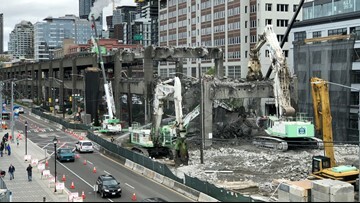 It takes crews about one week to demolish a single span segment of the Alaskan Way Viaduct in Seattle. Take in the work in one minute. Aerials of demolition work on the Alaskan Way Viaduct in Seattle on April 11, 2019. 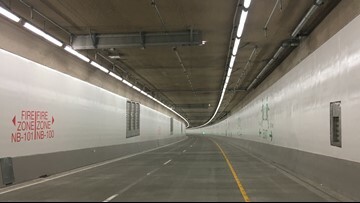 By the end of March, about 5,300 cars used the Seattle tunnel during peak travel times. 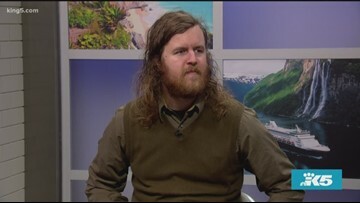 WSDOT had predicted the tunnel would carry about 7,000 cars. 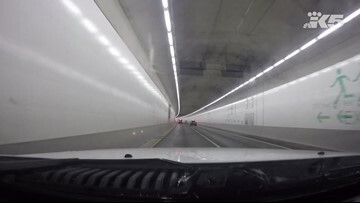 Take a ride through the Seattle tunnel - at timelapse speed! The Marion Street Pedestrian Bridge was expected to be closed March 30-31. 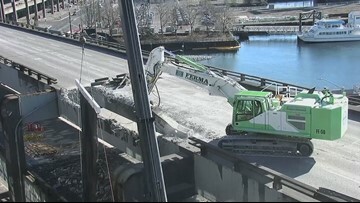 However, the closure was canceled after crews decided to hold off on demolition work above the bridge. 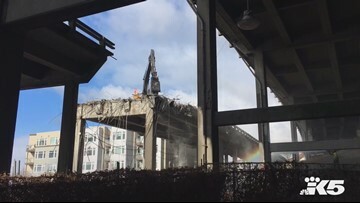 Crews have started demolition on the double-decker portion of Seattle's Alaskan Way Viaduct. 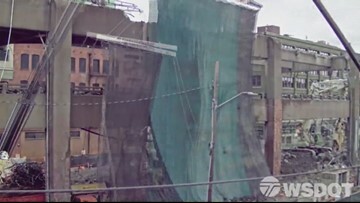 Watch crews demolish double-decker section of Seattle’s viaduct. 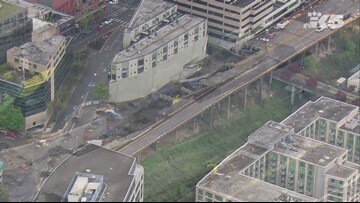 The Alaskan Way Viaduct is finally being demolished after 60 years carrying vehicles through downtown Seattle. 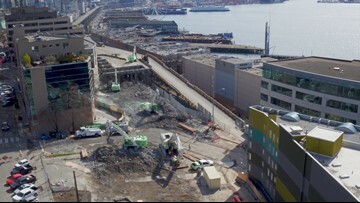 Take in a birds-eye view of demolition work of the Alaskan Way Viaduct north of Pike Place Market on March 15, 2019. 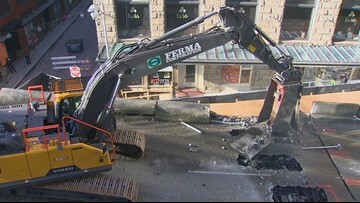 People living along the Seattle waterfront are getting an up-close view of crews demolishing the Alaskan Way Viaduct. A view of demolition work on the Alaskan Way Viaduct on March 8, 2019. 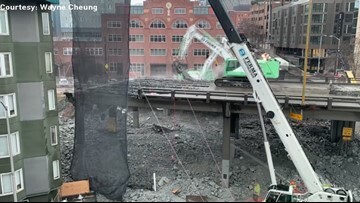 Photos of the Alaskan Way Viaduct demolition work on the Columbia Street on-ramp and the Western Avenue off-ramp on March 3, 2019. 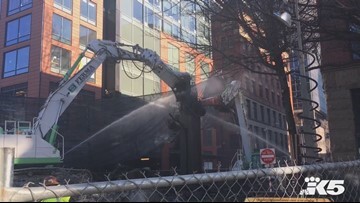 Contractors tear down the north end of the Alaskan Way Viaduct and the Columbia Street ramp and continue work at the Battery Street Tunnel entrance in South Lake Union on February 26, 2019. 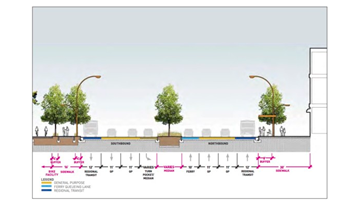 More changes are coming to Seattle's waterfront than many Seattleites realize. 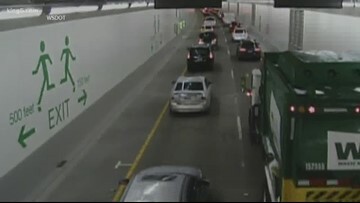 Tolling in the new tunnel under downtown Seattle could start as early as this summer, according to WSDOT. 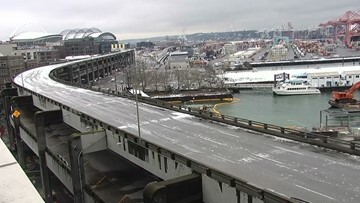 Watch crews construct the new SR 99 off-ramp to downtown Seattle in a new timelapse from WSDOT. 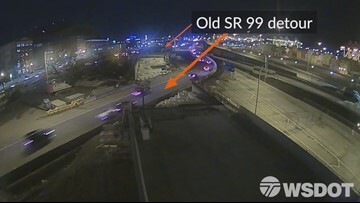 Take in five weeks of construction work in 60 seconds as crews build the new SR 99 off-ramp to Seattle’s SODO neighborhood. 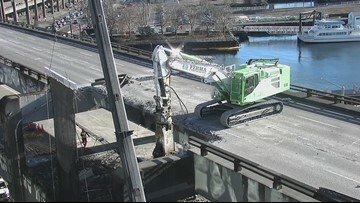 Crews tear down a portion of the Alaskan Way Viaduct on February 20, 2019. 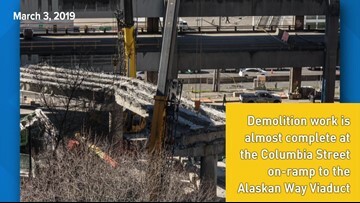 Crews begin demolition work on the Columbia Street ramp on the Alaskan Way Viaduct on February 15, 2019. KING traffic reporter Cam Johnson gives us directions. 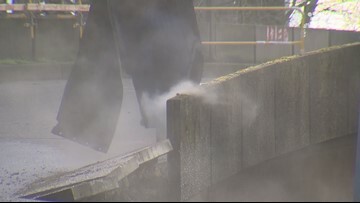 Crews could begin demolition work on the Alaskan Way Viaduct this week if the weather holds off. 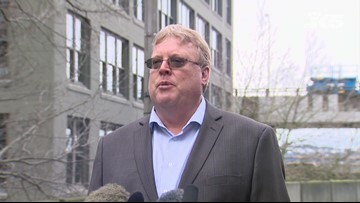 Phil Wallace, senior operations manager for Kiewit, the demolition contractor for the Alaskan Way Viaduct, explains how crews will remove the structure.